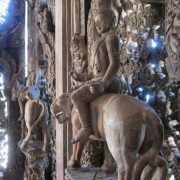 Sanctuary of Truth – a temple in Pattaya, Thailand, made ​​of wood with a lot of sculptures based on Buddhist and Hindu mythology. Height of the construction – about 105 meters. Made in the architectural style of “visionary art”, temple, in which the patterns based on traditional religious themes. The style of the Temple evokes Khmer architecture, displaying hand-carved wooden sculptures indicative of the imperial setting at Angkor. Meanwhile, the whole construction project began as an idea of a Thai businessman Lek Viriyaphant in 1981. In addition, the temple is not ready for full use, and its completion is scheduled for 2025. Located in Pattaya, on the shore of the Gulf of Thailand, stands an amazing temple of Truth, famous for its beauty and unusualness. Besides, it is the largest wooden temple built without nails. The monument of modern wooden architecture, The Temple of Truth attracts with its beauty a huge number of tourists from all over the world and is undoubtedly a landmark of Thailand. According to a legend, a fortune-teller predicted Thai millionaire Lek Viryapkhan that he would not die until he built the temple. In 1981, on personal savings, the rich man began building the temple of Truth. However, in 2000, Luke Viryafan died, and the temple remained unfinished. The uniqueness of the Temple of Truth is that it is built only of wood and without a single nail. However, they say, slightly hammered nails stick out, but the masters assure that at the end of the construction they will pull them all out.